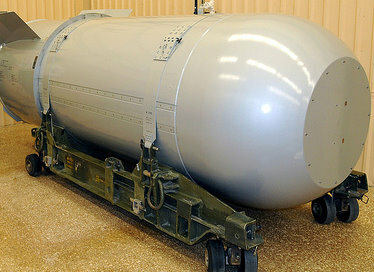 US to dismantle its most powerful Nuclear Bomb B53 ﻿﻿at the Pantex Plant near Amarillo. The Nuclear Bomb B53 created during the 1960’s Cold war is the most powerful bomb in history capable of 600 times more powerful than the atomic bomb dropped at Hiroshima, Japan. I am sure, you would have understood the seriousness behind this bomb. Just think for a sec, the atomic bomb that destroyed Hiroshima killed nearly 140,000 Japanese Civilians. Now, if this B53 bomb is 600 times more powerful than that which means if it would have implemented the B53 bomb would have killed over 84,000,000 innocent people. Holy Cow! What made US develop such terrible bombs. Even thinking about the scenario makes me tremble. US is indeed the baddest guy ever to rule this Earth! Coming back to the Nuclear Bomb B53 dismantling, the final components of the B53 bomb will be broken down Tuesday at the Pantex Plant near Amarillo, the nation’s only nuclear weapons assembly and disassembly facility. The completion of the dismantling program is a year ahead of schedule, according to the U.S. Department of Energy’s National Nuclear Security Administration. Earlier the Engineers had a very tough time designing the tool and new procedures to dismantle the B53 since the bomb which was made using older technology by the-then engineers are now dead or retired. “We knew going in that this was going to be a challenging project, and we put together an outstanding team with all of our partners to develop a way to achieve this objective safely and efficiently,” said John Woolery, the plant’s general manager. Many of the B53s were disassembled in the 1980s, but a significant number remained in the U.S. arsenal until they were retired from the stockpile in 1997. Pantex spokesman Greg Cunningham said he couldn’t comment on how many of the bombs have been disassembled at the Texas plant. Dismantling the Nuclear Bomb B53!!! The non-nuclear material and components are then processed, which includes sanitizing, recycling and disposal, the National Nuclear Security Administration said last fall when it announced the Texas plant’s role in the B53 dismantling. Once the process of dismantling the B53 bomb is over, the focus will shift towards dismantling B83 bombs which is second in power to the B53 bombs. Apple Stock Raises by $50! Previous: Afghanistan to Fight Alongside Pakistan if US Attacks! Li Na Wins Australia Open! Kingston Announces 1TB Pen Drives! !